HID's MaxiProx Reader is ideal for installations incorporating parking control and long read range applications. The MaxiProx reader packages all the electronics in one rugged, attractive and easy-to-install housing. Recommended cable is ALPHA 1295 (22 AWG) 5 conductor minimum stranded with overall shield or equivalent. Additional conductors may be required for LED or beeper control. Recommended cable is ALPHA 1297. Long read range distance (up to 6' with ProxPass). Autotune allows read range to be maintained within four inches of metal. Wiegand, Clock-and-Data and selectable serial outputs available. 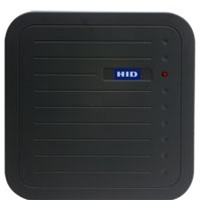 Compatible with all HID cards and tags with formats up to 85 bits. Multicolor LED with internal or host control of the LED and beeper. Two MaxiProx units can operate one meter apart for "HI-LO" (truck and car) installations. Reader supervision signal for CASI-RUSCO panels.